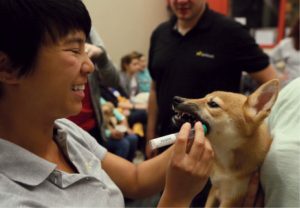 Open Wide: Embark geneticist and PhD student Erin Chu ’10, DVM ’14, swabs one of the canine athletes during filming of the Puppy Bowl last fall. Photos: CHU, Stuart Ramson/AP for Animal Planet. Patriots quarterback Tom Brady may have made football history on Super Bowl Sunday—but did he score a touchdown with a squeaky toy shaped like an ear of corn? 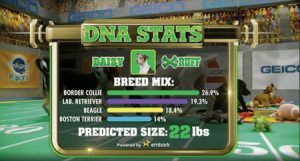 Embark’s profile of Team Ruff’s Daisy. Daisy’s ancestry wasn’t a matter of conjecture. With the other seventy-seven furry athletes tapped for Puppy Bowl XXIII, she’d had her DNA analyzed by a canine genetics company affiliated with Cornell—and the multiple shout-outs the firm got on game day spurred a spike in website traffic and a spate of new orders.